The newest flagship budget phone (Phew, that’s a lot of adjectives) from the stables of Micromax, the Superphone Canvas 2 aka A110 is making a lot waves; thankfully of the right kind. With 1GHz Dual Core Mediatek 6577 Processor, 512MB RAM, 8MP back & VGA front camera, the phone even sports Vanilla ICS build. The phone surely deserves the nickname Superphone & thanks to the massive 5” 854*480 WVGA Screen it can also justify the extension Canvas. The earlier iteration A100 was similar in most senses, but lacked Dual Core & 8MP camera. Oh & also the latest one has an IPS display, so expect great viewing angles. With a pricing that is merely Rs. 10,000 (US$ 180), the phone is a great package to own & experiment on! This post is about how to setup this smartphone to receive the great tweaks. As with any Android based smartphone, the first step is to ROOT it. If you don’t know what Rooting is, better research well before proceeding. There are multiple advantages & in some cases it is mandatory to have a rooted phone. Before Proceeding, charge the Battery preferably to more than 90%. Use Wall Charger as it offers a much faster charging rate than the PC based USB Charging. The Rooting Tool is called Root_With_Restore_Bin4ry. It can be Downloaded HERE. 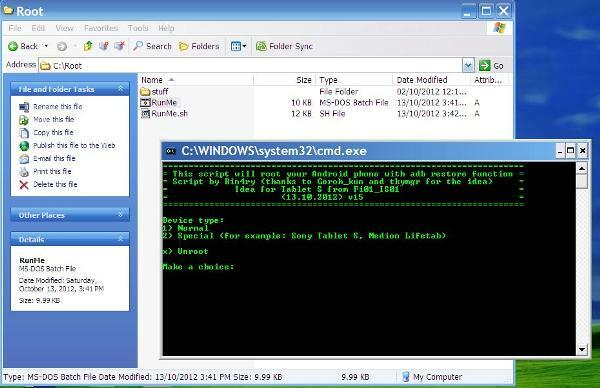 Once you ensure you have extracted the folders & installed the drivers correctly, proceed to the Rooting Process. Head to the C:\ROOT folder where you extracted the files within the Root_With_Restore_Bin4ry File. Double-Click on ‘RunMe.Bat’ file. 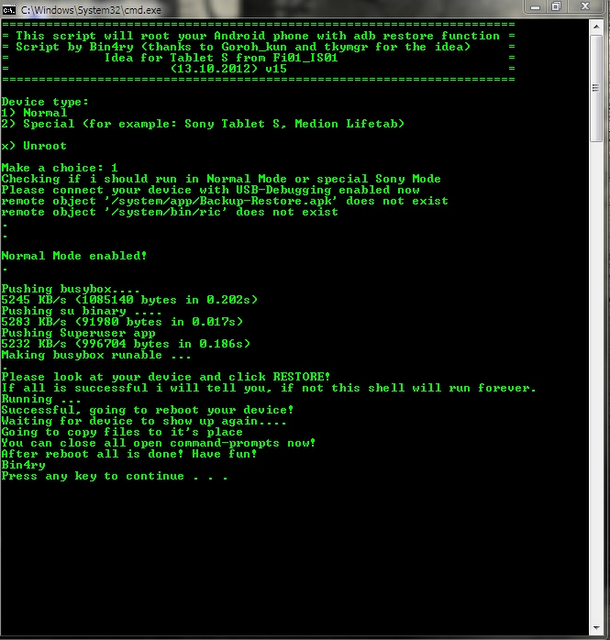 A Command Prompt Window with Green Lettering should appear. If it doesn’t, right-click the file & choose ‘Run As Administrator’. Ah Yes… You should have administrator rights for doing any & all of this. Now for MMX A110 enter 1 & press enter. Some wordings will appear on the screen simply ignore those. At one point the program will halt & give out the message: ‘Please Look At Your Device & Click Restore’. At this juncture if your phone’s screen is dark, hit the power button once to light it up & on the lower-right hand corner you should find the soft-button ‘Restore’. Hit it & your phone will have some files copied to it. You must not touch anything else now & let the program do its work. Your MMX A110 will reboot once the Rooting is completed. To confirm if ‘Rooting’ has been successful, go to the apps section & you should see SuperSU installed. If u are still unsure Go To Play Store & Download Root Checker (The Free Version is Fine). Install it & Run. Click On Verify Root. A Pop-Up Will Appear Asking for Permission to Allow Root Access. Click Yes / OK to It & you should get a confirmation about ROOT. Ensure ALL the drivers have been installed correctly. If not, opt for a different PC & begin anew. Patience is a virtue. This process can take anywhere between 5 min to 20 mins. Do not interrupt the process. Well, this is only the first part of securing your phone for future tweaks. In the next part, I will teach How To Install the famous ClockWork Mod (CWM) Recovery. This recovery partition replaces Stock Recovery & opens up multiple options to mod your phone, & best of all take a complete system back-up. Don’t worry; there will be an additional Post about How to correctly take a complete Nandroid Backup. In case you manage to completely screw your phone, then CWM & your Nandroid backup can restore your smartphone to perfect working order!